Over the last week Venezuela has seen upheaval in the national legislature and banning of the leading opposition figure from running for office. Both developments resulted in massive protests throughout the country and violent clashes with police. While it is clear the ruling Socialist government of President Nicolas Maduro—heir apparent to long-serving dictator Hugo Chavez—has a tight grip on power, it is possible they might have gone too far now, and have many within and outside the country demanding change. The trouble started two weeks ago, when Venezuela’s Supreme Court shocked many when it announced an intention to assume the functions (and power) of the country’s National Assembly. While the Supreme Court is loyal to Maduro, the National Assembly holds a variety of political views and was seen as the only opposition voice in the government, the only check on the regime’s power. Massive opposition to this move results in protests and international criticism. While Maduro walked back the Supreme Court takeover a few days later (on April 1st), those supporting the opposition demanded the Supreme Court judges be dismissed. They also called for the next presidential election, currently expected in late 2018, to be moved earlier, though it is highly doubtful the regime will agree to this. Protests continued throughout the week, with thousands filling the streets of Caracas carrying signs saying “No to dictatorship!” In at least one instance in the capital police fired tear gas at crowds. In my most recent report on Venezuela in January, I briefly mentioned that Henrique Capriles feared he would be blocked from holding political office by the Maduro regime. Capriles, a current state governor, had previously been a presidential candidate is viewed unilaterally as the best hope for unseating Maduro in the 2018 election. On April 7th it turned out his worries were well-founded: the government banned Capriles from holding office for 15 years. The national comptroller’s office issued the directive, claiming “administrative irregularities” including breaking contracting laws and improper management of donations. Regional and international organizations and governments condemned the action almost immediately. The U.S. State Department released a statement on April 8th saying it was “deeply troubled” by repression against Venezuelan opposition, and that it “reject[s] the rationales the Maduro government proffers for its repressive actions, which, when closely examined are spurious and, politically-motivated, and without basis in domestic or international law.” On April 10th, the foreign minister of Brazil Aloysio Nunes and chair of the Organization of American States Luis Almagro jointly called for national elections to be held in Venezuela, stating that elections are the “only solution” to the deepening political crisis. The action against Capriles sparked even more protests, some resulting in violent clashes with police. 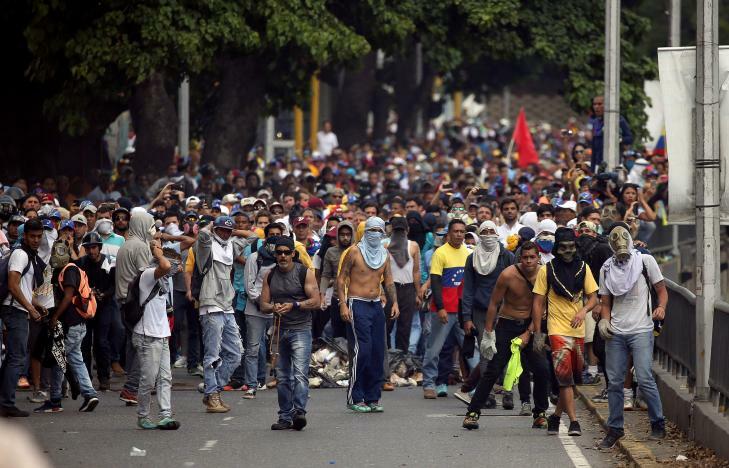 This is not necessarily new, as protests have popped up periodically in Venezuela over the last few years. But this time the outcome may be different. Some are hopeful that the government’s recent aggressive moves will be the fuel needed to re-galvanize and unite the opposition in demanding, and maybe even successfully seeing, regime change. Prying political power and control from a group as deeply entrenched as Maduro’s government will be extremely difficult. But there is reason to think it is possible, especially as Venezuela’s economic and political crises worsen. Even more troubling, Venezuelans’ quality of life—especially access to needed food and medicine—has not improved. It is extremely important for the international community to remain vigilant in demanding that free and fair elections be held within a reasonable timeframe. Perhaps non-partisan election observers should be put in place to ensure the elections’ validity, and that Venezuelans can vote for their choices without intimidation or fear of reprisal. Then, perhaps, the country can start on the road to recovery.